Ankervas Apartments - Morgan's Bay Accommodation. Situated in the picturesque Morgan Bay, Ankervas offers a high standard of luxury accommodation to the tourist and holiday maker. The apartments are spacious and tastefully decorated in Cape Cod furniture, a relaxing holiday style. 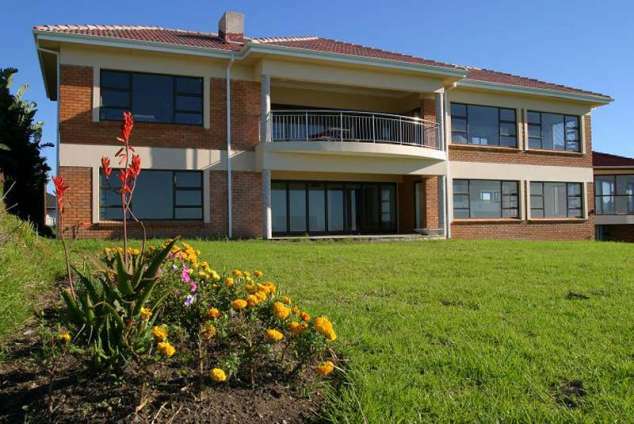 The apartment consists of a spacious open plan kitchen, dining/lounge area which leads onto a generous balcony, with a fitted braai, boasting a two million dollar,180 degree view over the sea and the renowned Morgan Bay Cliffs. Two bedrooms are equally beautifully furnished, all with a stunning view over the green rolling hills. The bathrooms, fully fitted with oval baths and double vanities, are spacious and portray an elegance out of this world. The extra guest toilets blend in with the bathrooms. The second apartment has a dining room/ kitchenette with stackable glass doors leading onto the balcony with the breath taking view. The spacious lounge furnished with cane and Cape Cod furniture, also boasts magnificent views of the sea. The three bedrooms are tastefully furnished and have an equally beautiful view over the rolling hillside. Added to this is an open air balcony (with Braai facilities) which is ideal for star gazing. There is no constant traffic noise to spoil your peace and quiet, just the sound of rolling waves.. Fresh linen and towels are provided as well as coffee, tea and sugar. A camp cot and baby chair are also available on request. Don't forget to bring your own beach towels! DStv is available, should you bring your own card. You are invited to relax with us. 17739 page views since 13 Feb, 2008. Last updated on 20 Feb, 2019.